"The Pension Records from the War of 1812 are among the most requested documents at the National Archives. Unfortunately, these fragile documents are in urgent need of digitization. In support of this monumental task of digitizing 7.2 million pages, Ancestry.com has provided a dollar for dollar matching grant, so every dollar you contribute will make four more pages accessible and free for everyone." It goes on to comment that the high demand for the records, available in no other format, makes them especially vulnerable to deterioration. Records are being uploaded as they are digitized, and are free to view here at http://go.fold3.com/1812pensions/ . Images will be offered for free at Fold3 indefinitely. My receipt tells me that my contribution will make over 1100 more pages available, which is a great feeling. Now, if only any of them had clues to my brick walls! A recent page-by-page reading of a county-level probate estate index was a powerful reminder: there may be much more than what the title describes. The film notes for the item I was looking at says: “General index to probate of estates v. 1, 1829-1894” (Hamilton County, Indiana). This is FHC film #1320375. While the majority of the film did indeed list the various motions involved in the settling of estates, there were several hidden gems. There were a number of guardianships listed, naming not only the guardian, but the bondsmen, and the wards with their ages, a few with actual birthdates. 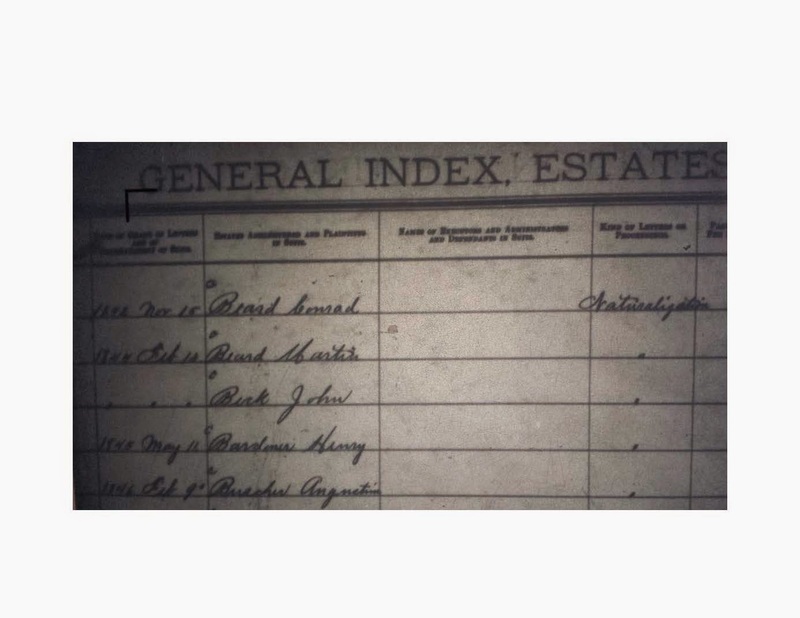 Sometimes the guardians and bondsmen changed throughout the years, providing more names as possible clues to family connections. One individual, Bertha Applegate “sometimes called Parker,” had a total of six guardians and eleven bondsmen during the same court date, which might suggest an estate of some substance was involved. There would certainly seem to be much to be learned, from actually reading the case! Another example of genealogical gold, was a land partition action relating to the death of Robert Barnhill in 1824. In addition to his widow, Sarah, one sees the names of 12 other individuals, male and female, who are probably children and sons-in-law to Robert. This is a powerful tool in the decades prior to 1850. The most unexpected list was that of a number of naturalizations from the 1840’s. These men pop up at the top of one page. Where the names weren’t easy to read, I’ve made a guess. They are: Conrad Beard, Martin Beard, John Beck, Henry Bardiner(? ), Bardmer(? ), and Augustine Buscher. Conrad and Martin Beard are found in Hamilton County, Indiana, in 1850, as is Augustine Buscher. A foreign-born John Beck or Bick isn't indexed in Indiana in 1850. The Henry Bardiner perhaps connects to the Henry Barder living in Greene County, Indiana, in 1850, listed as a native of Switzerland. I'm picturing my future: moving very slowly through stacks of microfilm and enjoying the view!